Many of us dream about working from home – sitting at our desk in our pyjamas, only having to commute down the hallway or garden path. However, more temptations are at home to distract us from our work, but channeled, they could become creative inspiration. “My work is very cute, twee and colourful, so Barbara suits my work and my work suits Barbara,” says Maude Farrugia. 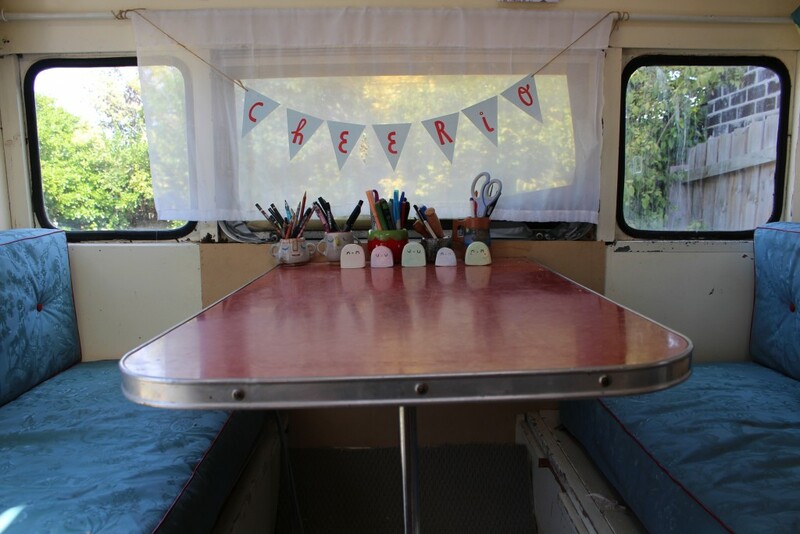 This muse is Barbara-Vann, Maude’s retro caravan and the headquarters for her stationary label Cheerio Paper Co.
Having bought a small house without a spare room she could work in, Maude found her caravan on Gumtree. Planted in the backyard of her home in Melbourne’s north-eastern suburbs, the journey to work only takes Maude a couple of steps. From her desk, she has a view over a thriving veggie patch and flock of chooks and quails. Being out of the house makes it easier for Maude to balance her work and home life, although she admits that isn’t always possible. Rhiannon Gill also works from her backyard, but previously her office was her couch. It’s a well-loved location, but an unexpected spot for a ceramicist to work in. “I’d have the bag of clay at my feet, a towel on my lap with a bat on top, working away while bingeing on Netflix,” recalls Rhiannon. As her partner started building his workshop in the yard of their Wollongong home, Rhiannon’s pottery becoming more of a career and less of a hobby, so they decided to share the space. Novelist Eliza Henry-Jones also credits nature as being a major inspiration, which is why she loves working from her small farm in Victoria’s Yarra Valley region. Eliza and her partner, who also works from home, share their home with their many animals. “My partner spends his days in his office with a cat on his lap, and I mostly write with my dog at my feet and a cat sitting on my shoulder,” she says. Rhiannon has the opposite problem, which is why she tries to set boundaries around her working hours, otherwise she mightn’t surface from her studio. “It’s often hard to plan time to see friends and do things, as once I’m in there I just keep going, and without set start and finish times I can be my own worst enemy!”, says Rhiannon. For Maude, one of the challenges of working from home is that her office space is quite the lure for visitors. “Whenever we have kids (or adults!) over to play, they inevitably all end up on the doorstep of Barbara, hoping to get a peek inside,” says Maude. It does however bring with it a potential new income stream. “I’m seriously thinking of charging a 20-cent entrance fee,” she says. First published in Audrey Daybook magazine, issue 7, 2018.